Today is awesome T-shirt Friday day! I wanted to share this rad shirt that was given to me by a friend. Not only does it have rainbows on it, but unicorns! What really throws me off is that this shirt is an X-Large! I mean, wow! For most of my life I could fit into a small, and then I gained some weight (being a full fledged, 34 year old adult, it's bound to happen), and I've grown into wearing mediums, sometimes larges (depending on the store). See how sunny it is in my bedroom? I wish the whole apartment had this much sun. Sometimes I wish I could move my art room into this room. I think working in here would make me so happy. I don't think my downstairs neighbor would like me any more than he does now. The floors/ceilings are apparently very thin in this building (seeing as all the apts on the whole block are about 100 years old). I think he would be very angry if he heard me sewing on my machine at 11 pm (like most days when I'm busy I work late). I suppose if I worked here, I'd no longer have access to my computer, so I wouldn't be able to watch shows or movies, or listen to music. Heh, I just noticed there are 2 pill bottles in the background. No, I'm not that kind of woman. :) They're melatonin and Valerian. Both to help me relax, and get a decent sleep schedule going. Sometimes I'll work 12-14 hour days, and go straight to bed, and I need these to help me wind down. Crazy! Just a little piece of art I drew in my new Moleskin recently. I'm still getting used to the really thin paper this company uses for their books. I only bought a Moleskin because the sketchbooks I normally buy haven't been in stock in the art store for a year. This is sad because Moleskins are ridiculously overpriced. Plus, the fact that a simple drawing felt tip pen bleeds through to the other side really bothers me. None of my other sketchbooks do that. So.... I now have to rethink the drawing tool I have to use. I think my Moleskin drawing tool will have to be a regular pen like this, sad, I know. I LOVE drawing with felt tip pens, but alas, not this book. Oh well. Margaret of Tranifer's Wonky Critters !!! She chose Chaucer as her one and only! Congratulations Margaret! I look forward to seeing photos of Chaucer in his new home. Next month, mid-April, I will be doing another giveaway. :-) Stay tuned! A old man approached me once at a grocery store as I was checking the eggs to make sure none were broken in the carton, and he told me this. He said that the eggs that had a lot of calcium were the ones that had the rough, bumpy shells. He then walked away. It stuck with me ever since. Since that day, every time I go to the grocery store to buy eggs, and I'm moving them in the carton to check if they're broken, I notice how smooth the eggs feel, and I wonder how delicate those shells must be, and how lacking they are in calcium. I think of that old man who told me this random tidbit. Honestly there hasn't been anything exciting happening this month, hence the lack of posts. As a plush creator, I don't create 1 new unique doll every few days like some of the part timers I've seen on Facebook. I have my set, and I just remake those when I need to. Occasionally if I buy new fur (like last month), I will have a few new ones, but they might end up my regular monsters if they sell. Here's a new monster I did yesterday for a customer. She lives in Australia, and she's my first Aussie customer. It's very exciting. This monster was made, and then my customer had asked me to make it with a happy face, so I kept this one hoping to find her a nice home. My Facebook fans have named her Cherry. Alright, so on to today's subject. It's Tuesday. Tomorrow I have a 15 minute presentation at 4 pm of my business plan in front of this committee. I'm to sell myself and my project to them, to hopefully win this grant so I can grow my business. I haven't even started working on my presentation, and it's already 11:30 am. I should really make breakfast (yeah, I know it's late but I haven't been sleeping well this week) and get cracking on this. I honestly don't want to do this, but I do want the money. The biggest thing I need to do is advertising to get people to my new store on Big Cartel It's not like Etsy at all. Big Cartel is for professional artists to sell their products. 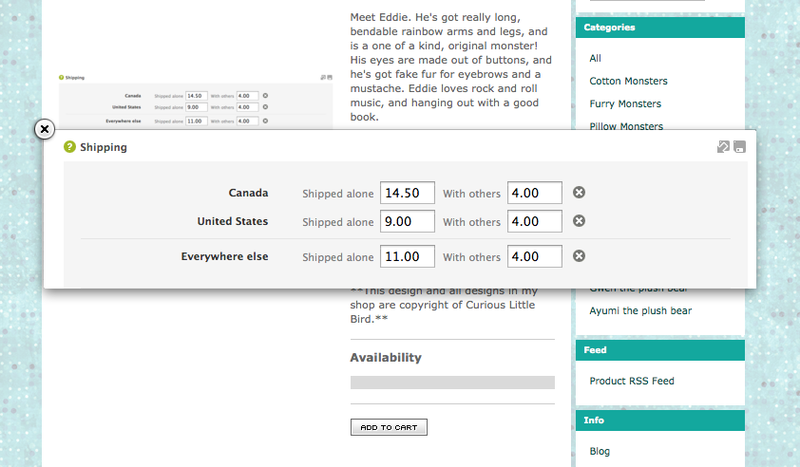 Etsy is a community, and an expensive one at that (one I'm trying to move away from cause it's making me poor). Currently I have 3 Facebook ads circulating the world of Facebook, and I've managed to get over 100 fans in a week which is great, but how many of those people will actually buy something from me? I need to reach even more people. So money is what I need. Today I didn't wear my brown suede boots, my Levi Silver jeans with all the funky patches, a stylish t-shirt and a really comfy sweater. I tend to work at home, and I don't feel like I should dress up to sit down and sew or cut fur. But yesterday I did go out to buy more felt, and I did wear most of what I mentioned above, except take away the suede boots and replace them with black and red plaid Rocketdog boots. 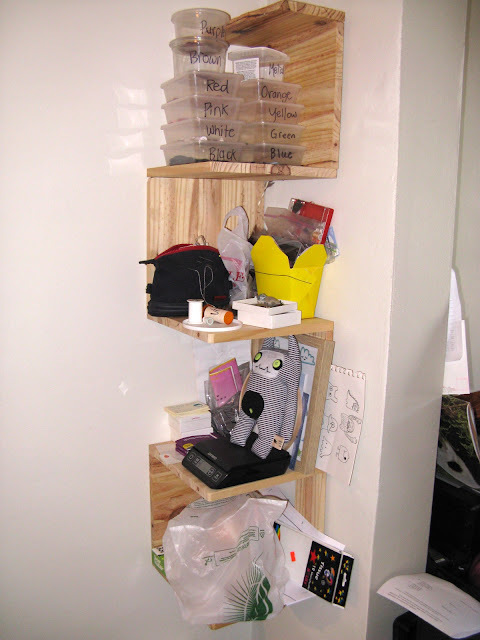 (I'd add photos, but it's so hard to photograph one's self without a tripod). Littleone is sitting on said suede boots. I find this cute when he does this. This is Squeak's favorite couch spot for relaxing. I bought some pesticide-free cat nip, and Littleone just went crazy for it (he's currently rolling around in it). Squeak thinks this stuff is no good and would prefer the stuff with pesticides. What a weirdo. 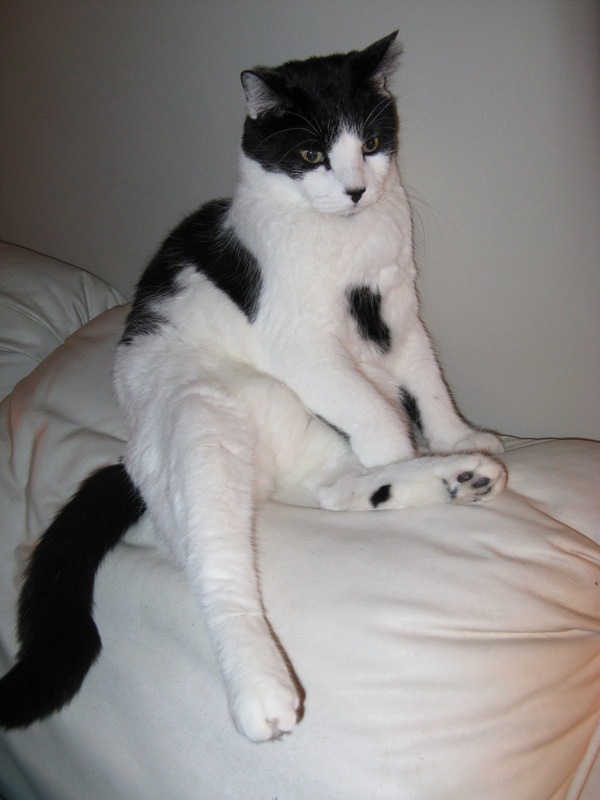 This is Squeak's sitting time. He comes up here at night and will sit like this before lying down for a nap. 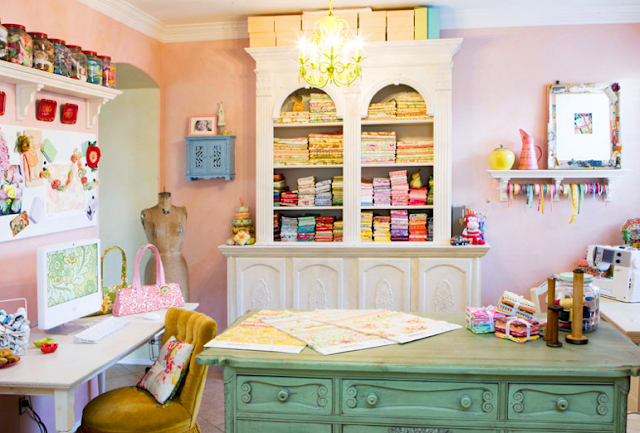 As per my fans requests, here's a post about my workspace or studio! This is where all the monster making magic happens! 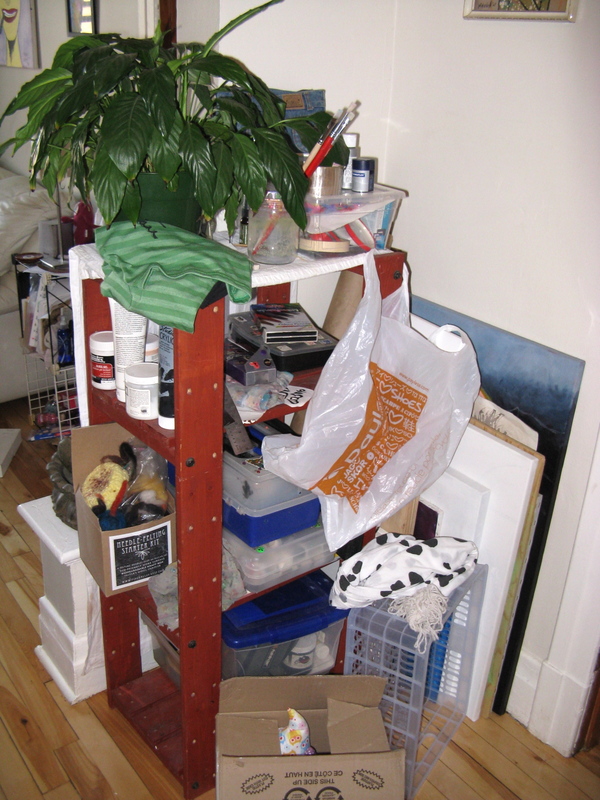 I live and work in a 2 bedroom apartment, and my studio is set up in the 'dining room' part of my place. It's a shame I have no windows in this room. I'd love to turn my bedroom into my studio, it'd be perfect, but as I work late into the wee hours at times, I don't think the people downstairs who go to bed at 9 pm would appreciate that too much. It's bad enough they have to deal with the deaf 88 year old lady who lives below them, and watches her TV in the kitchen very loudly, and until 4 am (or so I'm told). My irregular shelf my dad made for me. It's my scale, sticker, button and Burton monster holder. My desk/sewing area. This desk squeaks!! Drives me nuts. Oiling it doesn't seem to work. My paintings! My wall of fabric. Everything is stored in huge ziploc bags to keep it cat hair free. It's important because I have 2 cats. Well there you have it. It's not a fancy space by any means, but as long as I keep it neat, it does the trick! I could totally spend hundreds of dollars on some fancy shelving, but I think I'll save that setup for the day I buy my own place. 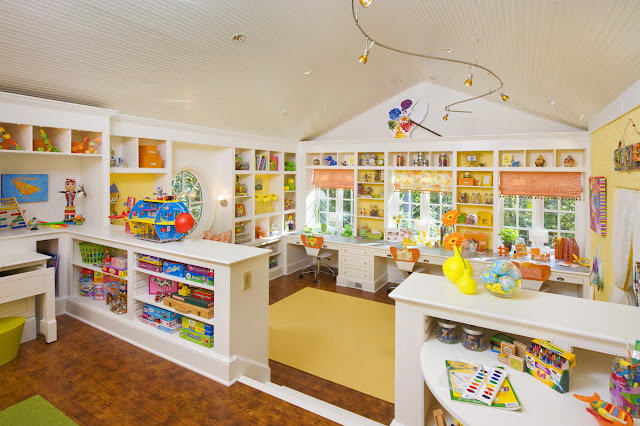 I know this is a kid's room, but how awesome would this be as a workspace???? AWESOME!!!! Or this room would totally rock too. I love that green hutch, or whatever you want to call it. These last 2 rooms are so bright and colourful compared to my drab and very uninspiring studio! LOL It's probably the flash on my camera, and the lack of windows. I'm not worried though. I know one day I'll be rolling in the dough, and I'll be able to do what I really want. I'll do a combo of the two pictures, throw in a few awesome vintage pieces of furniture, and a comfy chair for a little relaxation. I've asked my fans on Facebook for what they'd like to read about, so I decided to grab my camera and take some pictures around my apartment, as well as inside, to show you where I live, and what I like. Some random art. 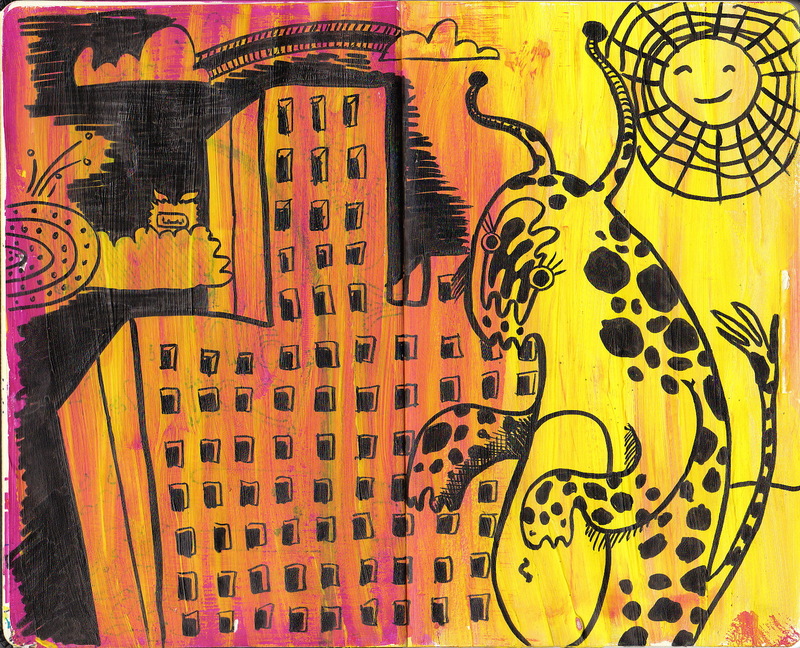 On the left I copied the image that was on the flip side because apparently Moleskin paper is thin, and felt tip pens bleed through a bit (I'm disappointed in that), and on the right I decided to draw part of a rainbow and some randomness around it. The view of my street from my front balcony. All those steps are the outdoor steps to get to the 2nd & 3rd floor apts. This is very typical of Montréal, Québec, Canada. Nowhere else in Canada have I ever seen apt buildings like this. Also, the trees haven't started to bud ... yet! The recycling truck is passing by, and as you can see people are getting impatient as the line grows longer. The view from my back balcony inside. This back area is so nice when it's cold out because it's sheltered and warm. My kitchen art! The kitties are Littleone (top left) and Squeak (bottom right). These are my favorite. Two birthday cards I got in 2010, and some rainbow fabric I'll never see again. I believe this is a bullet hole in some very old glass in the spare room. The landlord said the glass was pretty, so he left it. This apartment is about 100 years old. Maybe the ghost who lives here did that... or he/she died by gunfire? Living room art! My first painting of Tank Girl done in 2001, and the art on the right is done by Marie-Noëlle Wurm. I love it. My Japanese (and Australian) corner. The geta sandals were bought in Japan (city unknown). The wooden cat painting was purchased in Kyoto at a farmer's market. The artist painted this on Sakura wood, and it's technically a house sign with my name on it. The Buddha sculpture I bought on Miyajima Island, just off of Hiroshima, and the pink haired Geisha is a lucky charm, supposed to bring me wealth. In the back is another piece of artwork by Marie-Noëlle Wurm. Can't forget my beautiful boys in the picture frame, or my real Australian boomerang (brought to me by my dad when he was in the air force). A very heavy, all metal Buddha mask I also bought at the Kyoto market. I think I paid $25 for this or something. This is my ukelele which I love to play when I don't feel like working. I usually play "Creep" by Radiohead, or some other song. That's my hand painted Russian Nesting dolls (from Russia! ), and my lovely plastic cherry blossoms from the dollar store. Lastly my Russian Egg and a tiny crocodile head (very real) from New Orleans, both given to me by my dad. I hope you enjoyed a trip around my place and neighborhood! Happy Wednesday! Hi Everyone! Thanks for following my fan page on Facebook. As a thank you, I'd like to hold a contest, giveaway for 1 of the 6 following monsters and one eyed owls I have. Rules: The rules are simple. Valid entries to this giveaway will be on the blog only. Any tweets or blog posts you do must be linked back to this post with a comment. One lucky winner will win the monster or owl of their choice, but will have to pay for the shipping of the plush to their country or province. Those who live in Montreal will not have to pay shipping, but can come and pick it up. What can you win? One lucky winner gets the one eyed owl or monster of their choice! Who can enter? This giveaway is open to anyone, anywhere in the world! How to enter: Visit Curious Little Bird's website and leave a comment on this post telling us your favorite item. ♥ Like Curious Little Bird on Facebook. ♥ Follow Curious Little Bird on Twitter. ♥ Follow the Curious Little Bird blog. ♥ Post about this giveaway on your blog (leave your link in the comment). Entries will be accepted until Midnight on Saturday, March 24th. The winner will be chosen at random and announced soon after! In less than 2 months my www.curiouslittlebird.ca URL will be expiring, and when I renew it, I will be removing it from the blog, and reinstating my blogspot URL which is melanieaudet.blogspot.com. My store on Big Cartel will be taking over the curiouslittlebird.ca URL, so all of you who follow this blog, or have the feed in Google Reader, please take note that you will have to re-follow me when the URL changes, and you'll have to change your feeds. Don't worry though, it won't happen until May, and when it gets closer to the date, I'll let you know again. I simply wanted to warn you all in advance. If you would like to start now, the regular URL is http://www.melanieaudet.blogspot.com You can change your google readers to that link, and it'll redirect you. Hello! It's ... oh, it's already 12 am on Thursday morning. I've been working hard to add to my store, and thought I'd take a break and write a post. I noticed I haven't written one in a few days, cause not much has happened really. I do have some new monsters from new furs (some furs I had for a while but was hesitant to use - but now glad). These will be a limited edition, as I may not go back and buy more, or I might. It really all depends on how popular they are. My fave. I call him "Puffy"
This silver fur is so soft, and I love the pattern on his arms and legs. This fur I wasn't sure about, but it turned out to be pretty awesome! Some really cool fuzzy, matted-looking shaggy fur in a shiny silver. The softest, cushiest orange fur ever! This is a dark teal green-blue fur that's really fine. Well, I had a good weekend. I found out that all my furry monsters have sold out at Perfide, and I think they'll be sold out at Tah-Dah! very soon as well (since I only had 4 in the store the last time I spoke to the owner). This is very exciting news! I am so happy to hear that they're doing so well! I knew they would. 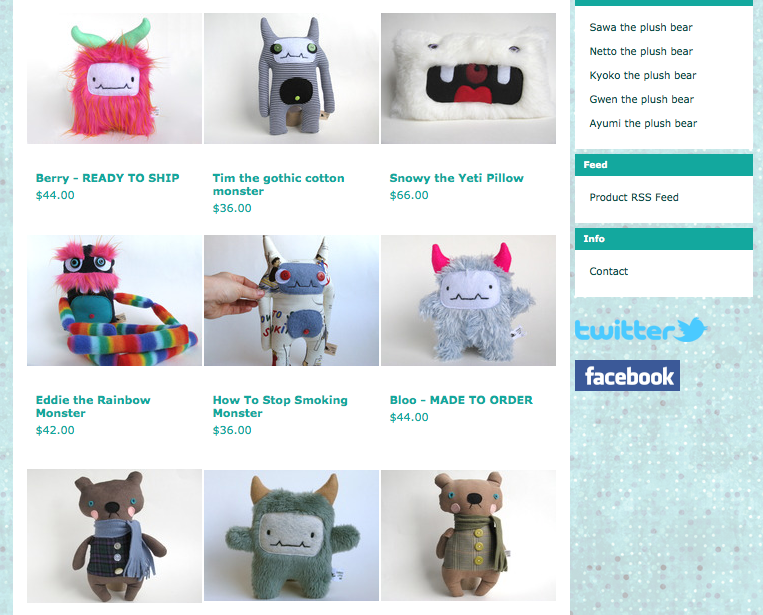 :) The furry guys are by far my most popular monster. 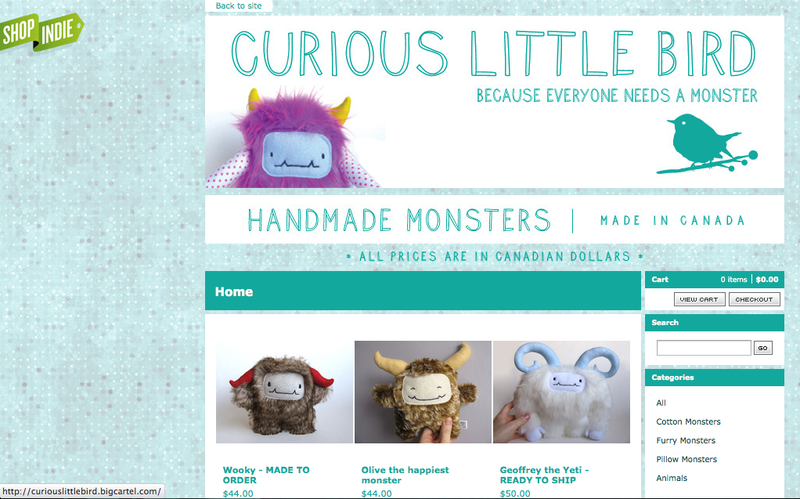 I'm also selling Harolds, foxes, bunnies and furry monsters at Minizabies. Check it out!! I made some new monsters a few weeks ago, and have been busy with finishing my business plan, so I didn't get around to blogging about them. One of the new monsters got featured in a blog by i only like monsters, and it's really awesome! Follow this link to check what other monsters were included in the blog. :-D My feature on this really awesome, monsterific blog! This is the romantic Victor. He wears his heart on his belly, to show he loves you! This is Tim, Burton's twin. He loves gothic films, and random things. This is the furry bellied monster. She's fancy, and very rare! This is Pinky. She's made out of some really funky, vintage fabric from a smock. This is the non-smoking monster. His fabric is a very rare printed "How To Stop Smoking" fabric. He is definitely one of a kind, and very rare. Non-smoking monster encourages you to quit while you're still healthy. This is Jesse, the batik monster. She's got some crazy fabric and some crazy colours going on. This is Eddie. He's a monster that loves to pose, and can sit any way you want him to! This is really a dark teal greeny blue. For some reason the camera made it lighter. If you're in Montreal, stop by one and grab yourself a monster. Because everyone needs a monster, remember? I should have them up for sale in my Big Cartel shop by the 3rd week of March. They may not be for sale on Etsy. I'm finding that website is becoming a very costly place, and will not be uploading as many new items. My Big Cartel shop is attached to my Facebook page, and is better because you don't have to log in, or have an account to buy. :-) I know that that is very important for some people.